If there is good weather you can meet us at the playground at “Fürstenplatz” in Düsseldorf on tuesdays, wednesdays and saturday. 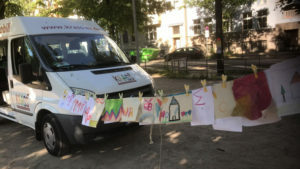 The “KulturMobil” will be there. You want to play drums and make some art? Than you can come to our KulturMobil activites.